As soon as the submarine was lost, efforts to find her began. The Union fleet dragged the area around the USS Housatonic wreck in hopes of snagging the little submarine. Generation after generation of explorers scoured the sea around the site of the fallen Housatonic, hoping to discover the legendary H. L. Hunley and her doomed crew. The world would have to wait until technology caught up with the search, with modern tools ultimately helping locate her. After fifteen years of searching, on May 3rd, 1995, New York Times best-selling author Clive Cussler and his team finally found the submarine. 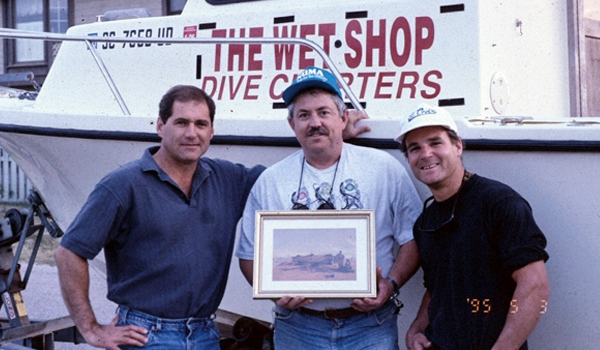 Long interested in maritime history, Cussler founded the National Underwater and Marine Agency (NUMA), an organization that searches for some of history’s most famous shipwrecks. “I have never made claim to being an archaeologist. I’m purely a dilettante who loves the challenge of solving a mystery; and there is no greater mystery than a lost shipwreck,” said Cussler. 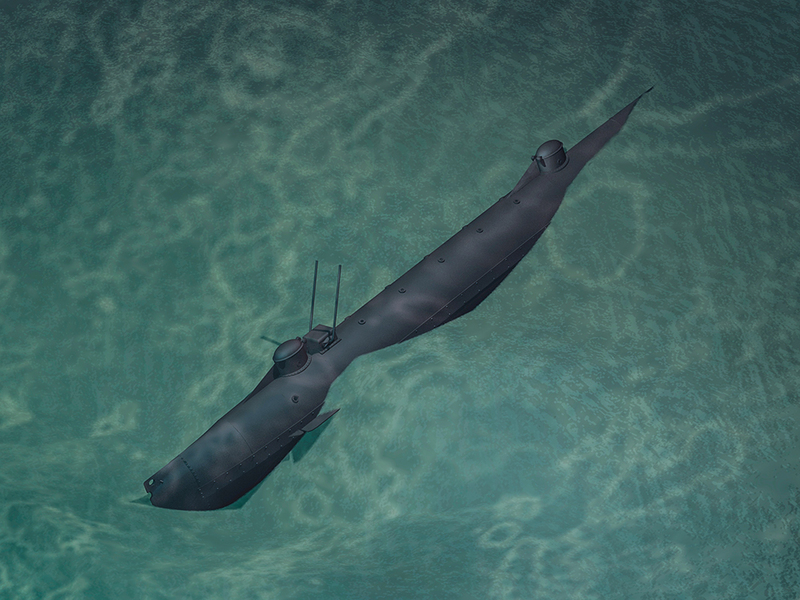 Finding the world’s first combat submarine was a mission right up NUMA’s alley. Much like the Hunley in her mission to make world history in the 19th century, NUMA didn’t get lucky the first time. Using a magnetometer, the Cussler crew located a metal object about four miles off the coast of Sullivan’s Island. After diving in nearly 30 feet of water, they removed three feet of sediment to reveal one of the Hunley’s two small conning towers. As if stuck in time, the Hunley lay on her starboard side with the bow pointing almost directly toward the Housatonic wreck and Sullivan’s Island. Her position looked like she was heading home, a trip that was finally about to be completed over a century later. May 3rd, 1995 - The Hunley discovered by NUMA. 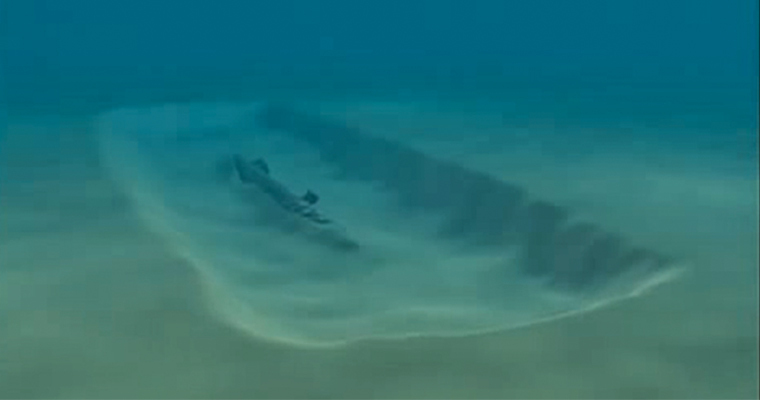 The Hunley Found: What Next? • Originally built as a privateer vessel in support of the Confederacy, who owns the Hunley? • If there are human remains onboard, how should they be treated? • Should the submarine be left at sea as a war grave? • How will she be protected from looters now that her location is known? These questions and many more would take years to answer. It was ultimately determined the Hunley was owned by the United States government. To protect the vessel from looters and ensure the appropriate treatment of any human remains, she had to be recovered from the ocean and conserved. Given the submarine’s deep historical significance, the decision was made to put the Hunley on display as one of America’s great maritime artifacts. 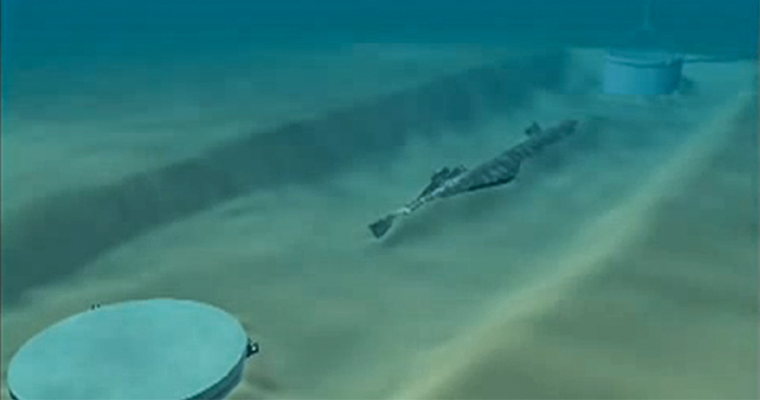 Raising the Hunley from the ocean floor was a daunting task. Coordinating with the appropriate entities at the state, federal and local level required the delicate touch of someone familiar with government. Senator Glenn McConnell answered the call. He helped negotiate a contractual agreement that outlines the appropriate manner to treat the Hunley, an irreplaceable piece of American history. While Senator McConnell navigated the different government jurisdictions, someone needed to raise money and manage the actual lifting of the Hunley from the ocean floor. When Senator McConnell first asked Warren Lasch to fill this role as chairman of Friends of the Hunley in 1997, he had only one question: “What’s the Hunley?” The answer changed his life. Lasch, a successful businessman, became the driving force behind the project. McConnell and Lasch made an incredible team and together, they would achieve what many thought impossible. 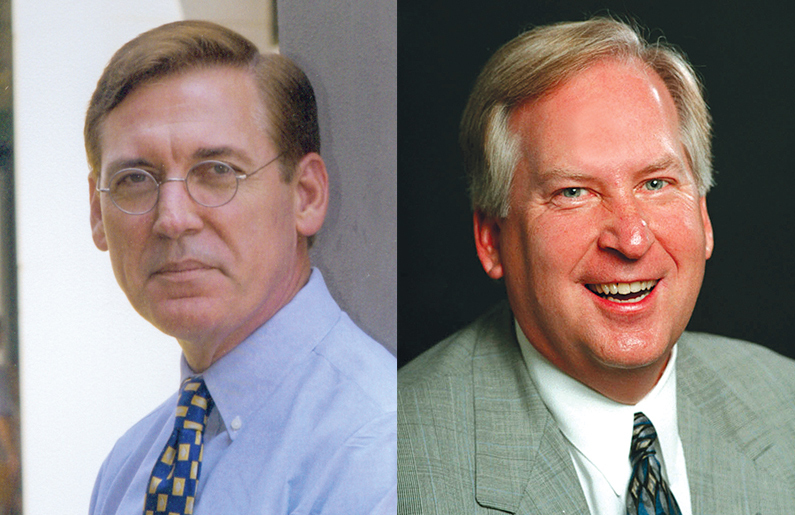 Glenn McConnell (left) and Warren Lasch (right). 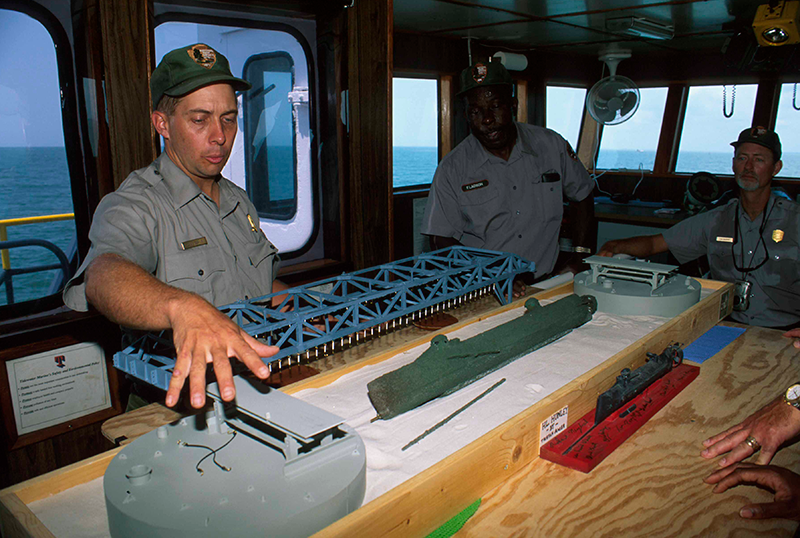 To get the job done, he pulled together an international team of experts and partners, including the Department of the Navy, the National Park Service, Department of Natural Resources and Oceaneering International. They developed a state-of-the-art plan that required precision timing, flawless engineering, highly trained divers, perfect weather conditions and a little luck. As part of this incredible undertaking, Friends of the Hunley Chairman Warren Lasch brought together a high caliber team. Lifting the Hunley would be a delicate undertaking. 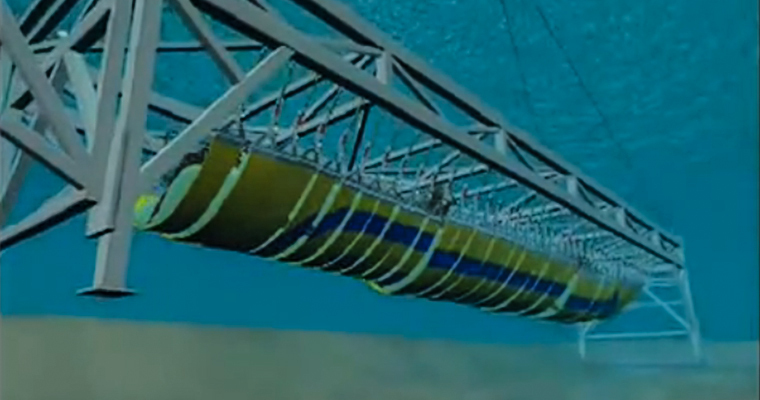 Weight distribution would have to be consistent along the approximately 20 ton, 40 foot submarine throughout the entire process. Otherwise, it could break in half and be destroyed, something that has happened in recovery efforts on other marine artifacts. This would be no easy task since the Hunley was submerged 30 feet deep in murky, choppy ocean waters. Divers excavated an area approximately 40 feet wide by 130 feet long to expose the top of the Hunley. Two massive 18 by 12 foot, custom-engineered suction piles (typically used in deep water oil rig mooring systems) were placed on either side of the submarine to provide a stable platform for the recovery work. A large overhead truss was lowered onto the submarine and attached to the suction piles. 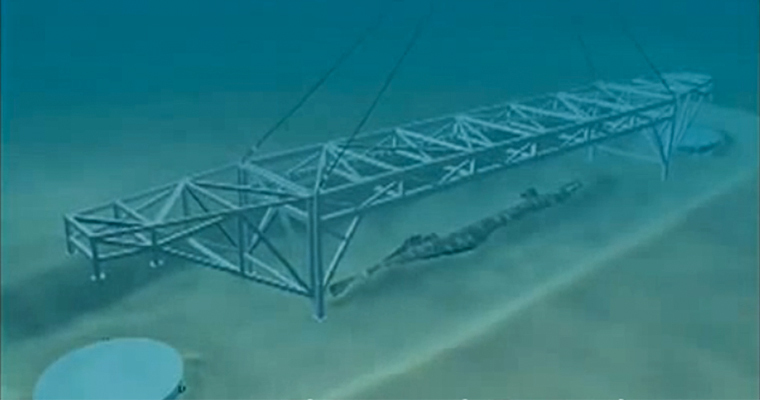 Machines lowered the truss over the wreck site and then divers helped guide it into a level position straddling the Hunley. Divers carefully burrowed small tunnels beneath the submarine, inserting thirty slings one by one and attaching each to the truss. A load cell monitoring device was attached to each sling to alter and monitor weight distribution. The load cells also sent an alarm in the event weight became unevenly—and dangerously—applied during the recovery process. 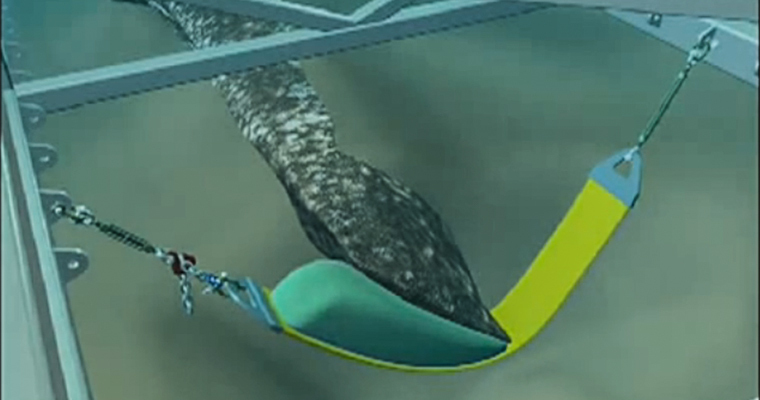 Each sling was injected with inflatable foam that conformed to the contours of the vessel, creating a safe cradle to lift the Hunley off the ocean floor. 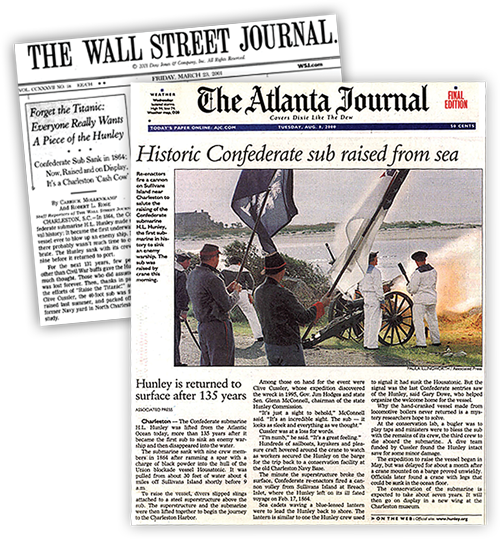 August 8, 2000 – All eyes were focused on this Southern port city to watch the Hunley – the world’s first successful combat submarine – finally return home from a voyage that began well over a century ago. The harbor was filled with on-lookers. Spectators and reporters from around the world lined the docks, watching history unfold. Lift the Hunley – Just as the crew did in 1864 on the night they made world history, the recovery team waited for a calm sea for the actual lifting of the Hunley. The well-planned recovery procedure was completed flawlessly, with the historic artifact raised safely. 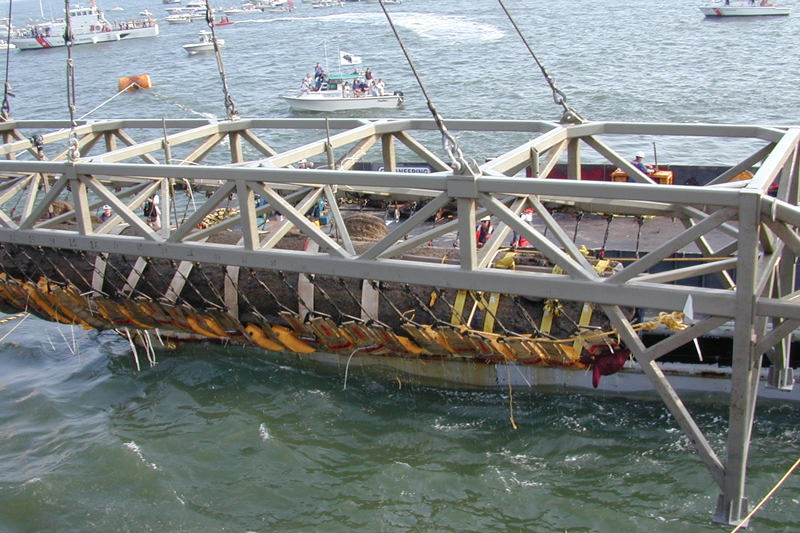 After the Hunley broke the water’s surface, she was gently placed onto a transport barge. Support personnel stabilized the submarine with tension straps to keep her safe. She was brought to the Warren Lasch Conservation Center and placed in a 75,000 gallon steel tank filled with chilled, fresh water to help protect and stabilize the submarine. The lab facility was specifically designed to excavate and conserve the vessel. Now that the Hunley was safe, the work of learning her secrets could begin. The groundbreaking excavation of the Hunley’s crew compartment unearthed rare 19th century artifacts, including a gold coin that saved the life of the submarine’s Captain at the Battle of Shiloh in 1862. The coin is curved from the indention of a bullet and inscribed with his initials along with the words, “My life Preserver.” The remains of the entire eight-man crew were also found resting peacefully at their stations. They were removed from the submarine and plans were immediately put in place to give them a proper burial, an event that had been impossible for over a century. August 8, 2000 - The Hunley is raised from the sea.